Automobile - Visual Dictionary - Copyright © 2005-2016 - All rights reserved. [img]https://infovisual.info//storage/app/media/05/img_en/001 Automobile.jpg[/img] [url=https://infovisual.info/en][/url] - [url=http://www.infovisual.info/]Visual Dictionary[/url] - Copyright © 2005-2016 - All rights reserved. 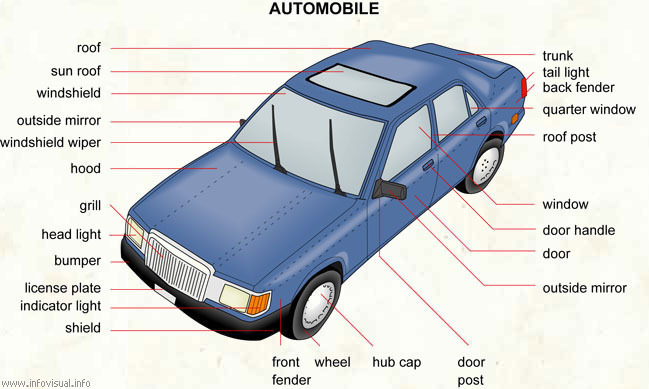 Automobile: road vehicle that is motor-driven and is used for transporting people. Window: mounted pane of glass. Front fender: side fore part of the body that covers the wheel. Windshield: the front window of a car. Roof: upper part of a car, covering the passenger compartment.